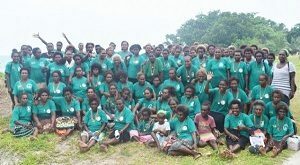 SINCE its inception in 2004, Solomon Islands Women in Business (SIWIBA) has always been a Honiara based association. Not because we decided to keep it that way but due to financial constraints has not been able to.However, it has always been a long time dream to eventually reach out to the provinces when time and finance permits.In August 18th 2017 that dream became a reality when SIWIBA was able to kick start its Provincial Reach. Ethel Saelea, SIWIBA’s Board Secretary, Pamela Zoleveke, President and a Paranikeni member Nester Deve travelled to Marau to kickstart the provincial reach. SIWIBA has earmarked its Provincial Reach to start with the most closest three provinces. That is, Guadalcanal, Central Province and Malaita. From information gathered, it was easy for us to reach out to Marau Sound Paranikeni Association as it is a well-organized group and probably look at other areas down the line. Paranikeni is the first women’s group SIWIBA ever come across that is so well-organized with a very strong executive and a membership of 400 plus. During our induction/information/training meeting on Saturday 19th August, SIWIBA registered the group in through affiliation. The reason for affiliation is for obvious reasons, it is cheaper to send a Trainer, SIWIBA’s Training Officer to Marau to conduct training. The Program Officer can also go down and help set up their markets. For that, to kick start their market, SIWIBA is providing five tents for the group to help set up. Marau is quite close to Tavanipupu Resort, we are hoping to set up some kind of understanding there so the women can go to the resort or the tourists come to Marau to buy the members products. Paranikeni Women’s Association, can now have access to services SIWIBA provide to its members. Whenever members of Paranikeni are here in Honiara and an activity or training take place they can come to the office, give their names and once checked against the list and confirm members of Paranikeni, they can certainly join. The President of Paranikeni and Secretary would furnish SIWIBA with list of areas they wish to train on and as soon as the office put together the training requirements and finance permits, an appropriate Trainer and the Training Officer will go down and conduct training. SIWIBA has approached Rokotanikeni’s President Dr Alice Pollard for SIWIBA and Rokotanikeni to work in partnership in providing services to the Provincial women. SIWIBA go in and set them up as members and Rokotanikeni will take care of setting up savings for them. An MOU is to be signed soon to allow us work together in partnership to help our women. This MOU will cover provinces that we go to. This MOU will state out clearly our different roles in setting up such partnership. So God help us. We will continue with it and especially with the saving and training and helping them have access to markets, we hope to help our women. As we all know working and managing women’s organisations is not an easy task but I also believe when leaders of organisations working amicably together and there is no conflict of interest on their part, will help a lot when conflict arises. I would like to acknowledge the Government of Australia and its tax payers through the Australian High Commission Office here in Solomon Islands for funding SIWIBA and for assisting us in reaching out to the women of the rural areas. On behalf of SIWIBA members, both in Honiara and the Provinces, I would like to thank you so very much from the bottom of our hearts for your great assistance to the women of this country. God bless. Put together and approved by the President of SIWIBA, Pamela Zoleveke.